In our first article yesterday, Fantha Trackers shared their best advice on what to bring to a Celebration. In this article we take a look on how they plan their Celebrations, in order to get the most out of such a huge events. When I go into Celebration I don’t have just a plan, I have plan A, plan B and plan C ready to go. As soon as the panel schedule is revealed, and all other events that I am interested in but might not be in the official program, I sit down and make a list of what I really want to experience. I put the events in different categories and then I try to prioritize what I really want to do the most. How long will I be willing to stand in line for a certain event? If the line looks to be longer than I am prepared to wait, do I have another option that I could go to instead? I usually pick one main panel for the morning and one for the afternoon, and then I have back up plans depending on if can get to them or now. I personally think it’s more fun to go to a smaller panel, without a line, and to catch up on the major panels online later. Planning is a tough one. If you plan your day carefully, guaranteed it will not happen according to plan. You need plan A, B and C. You need to be fully aware of the layout of the convention circuit as soon as possible. Where are the queues for the main panels? What are the shortest routes? Where are the refreshment stalls and toilets – may sound obvious but it will save time. In Orlando it was very obvious which places were too busy so I avoided them, and that saved me a lot of time. Plan for not being able to achieve 1/2 of what you want to, and focus on what you REALLY want to do at the show. I have been reading a lot on the various Facebook groups about what people want to do and see and worrying about will they get to them all. The short answer is you won’t. for no other reason than there is so much that you simply won’t fit it all in. It is at this point I would recommend that you manage your expectations and then decide what your top priority is for each day whether that be a panel or autograph or buying a convention exclusive. As soon as the schedule is released work out exactly what you want to achieve, but don’t be too ambitious. At Celebration Anaheim I knew I had to be at The Force Awakens panel and at Orlando I knew the 40th panel was my major goal, so with that in mind I wrote off my night and any parties or get togethers and prepared for an overnight queue ! I was there in plenty of time 3pm the previous day for the 40th panel and 1.00am for The Last Jedi panel. I was not disappointed and I got into both! In London it was a little different queuing (although we Brits are expert at it) was not allowed overnight and the hall only opened early in the morning it was a little less frantic however again I made sure I was there for opening time and I was at the front with my wristband secured and then went back to bed! It’s hard to know at the minute what the system will be for SWCC, but just ensure you’ve decided on your priority panels and know what sacrifice you need to make to get in! The other thing is don’t plan on using the Celebration app live, with so many people even the most high speed wifi networks will struggle! Before you go, set it up and then screen shot it so your daily plan is available is the app crashes or even better (sorry all you techies) use the programme with post it notes and highlighters! So my advice is have a top priority each day – anything else is a bonus!!! I recommend planning as much as you can ahead of time, especially, determining the one or two things that are MUST dos at the event. 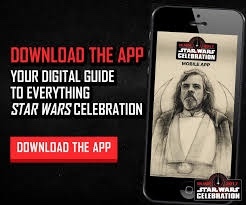 I also recommend downloading the Star Wars Celebration app to help you determine ahead of time where these must do events are located, how far you have to go there get there and to receive any last minute updates straight from the Event! 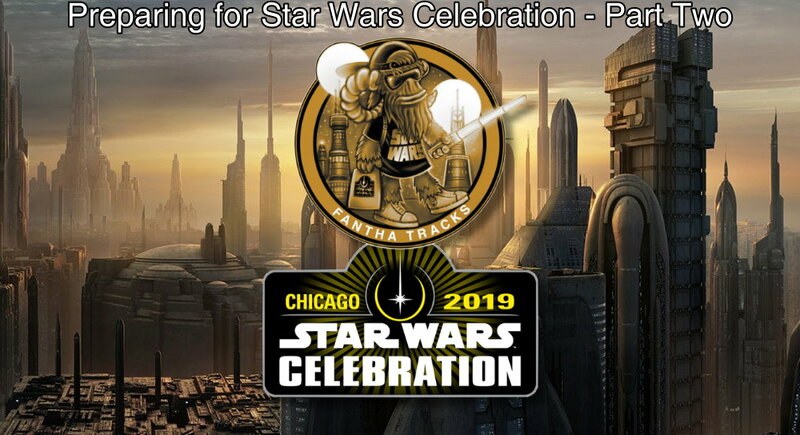 My fellow gold shirts will tell you, planning isn’t my strong point and this time round at Celebration it’s probably just as well that much of my time will be occupied overseeing the podcast stage. That said, with the help of my ‘crew’ Paul and Clair I do hope to grab the opportunity to step out and see a few panels, catch up with some friends and take in the show (and buy a few goodies to display in Echo Base). With that in mind, our chief organiser Brian has worked up an excellent spreadsheet of all the various panels, allowing the team to pick which panels and talks they want to go to. Primarily, that’s to make sure the booth is always covered, but it’s also a brilliant way to schedule and plan. For a huge location like McCormick, make sure you scope it out on arrival and see how long it takes to get from A to B – then triple that time for crowds. Here’s the thing… and you will here this from most people: plan for your plan changing! Once the schedule comes out, figure out which panels and events are a must and write those down. Then go back and figure out what your back-up panels and events may be. Make sure you make time to get on the convention floor to visit the vendors, Star Wars Show stage, and the store. Also, make sure to make time to visit with friends, relax, and eat! Use the Celebration app, use your phone calendar, use a planner, use anything that you will be able to carry with you and have easy access to. But overall, relax and have fun! You will see so much outside of panels and events because Star Wars fans are amazing! Side note: If you are planning to explore Chicago and visit any museums, restaurants or other venues, make sure you figure out where you are going before you go! And get your tickets ahead of time. Chicago is a very busy city and reservations are sometimes required. Be prepared to be like the proverbial kid in a sweet shop – there will be so much choice and you WILL NOT be able to do everything you want to do, so review the schedules and have a first choice and alternatives for each day. If you get several panels in a day then that’s a bonus, but also be aware that some of the more popular panels are live broadcast to other stages – not quite the same as being ‘in the room’ but still a great way to see some of the content you may otherwise miss. And if you are lucky to get a wifi signal, or have a robust data plan on your phone or tablet, you can potentially stream content for some panels – handy if you’re doing other things or waiting in line.